A practice is composed of one or more workouts. Once you've scheduled practices and written workouts, you then need to connect those workouts to practices. 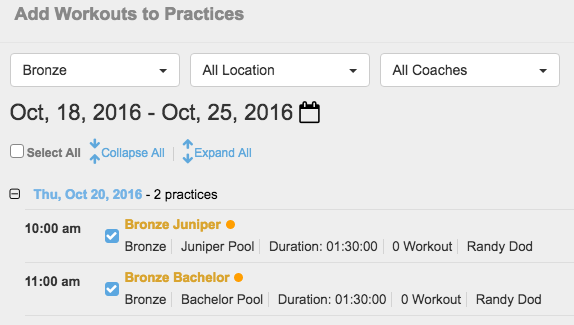 You can add multiple workouts to a single practice instance—one for each swimmer group. For example, you may have one workout geared toward sprint swimmers and another for distance swimmers. They will all need to be in the same roster group and location. You can also add the same workouts to multiple practices. We will show you both ways. Click the name of a desired practice to edit it. You may also check the box by one or more practices, then click Edit > Edit Practice. If you do not see any practices, make sure no filters are active. If there are no practices in your calendar, you will need to schedule a practice first. If there are no Coaches attached to the practice, click Select Coaches, select one or more coaches, and click Done. You can either click + Create New Workout or add workouts from the Workouts Library on the right. We will cover the latter here. 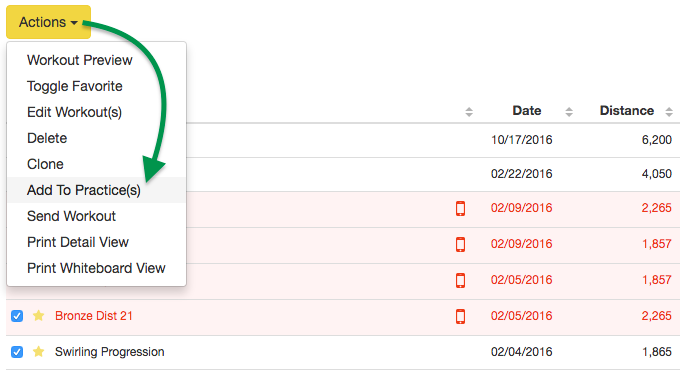 Use the Search field, Sort and Customize Filters to find a desired workout. Workouts in red have a test set. Click a workout to see its details. Click Add Workout to do that or anywhere outside of the details to hide them. Once you find a desired workout, double click it or drag and drop it to the Workouts area on the left to add it to the practice. After adding workouts, click a workout name if you need to edit it. Click the red x to the right of a workout to delete it. Click Hide Workouts if you want only coaches to see them. Adjust the Duration of the workout if needed. 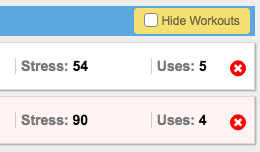 Add Practice note if desired. Click Actions > Add To Practice(s). Use any filters at the top to narrow down practices if needed. Click + by any date to expand it and view its practices. Select practice(s) to which to attach workouts. You are now ready to take attendance for those practices.